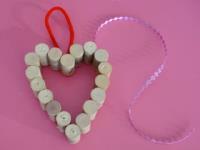 With Valentine's Day just around the corner, complete this cute and simple craft with your group! 1. Gather your material. 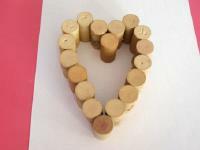 You will need several corks, a red pipe cleaner, pink, red, and white feathers, ribbon, waxed paper, white paper, glue, scissors, and a crayon or marker. 2. 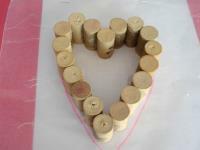 Arrange the corks on the white paper, forming a heart shape. 3. 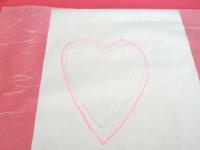 Use your crayon or marker to trace the outline of the heart shape. 4. 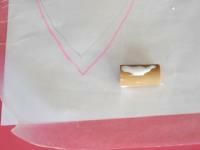 Set a piece of waxed paper over the heart shape and staple (or glue) it to the top of the white paper to secure it in place. 5. 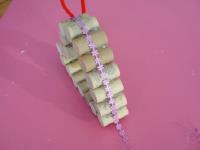 Apply white glue along one side of each cork and stick them on the hear shape, pressing them together. 6. 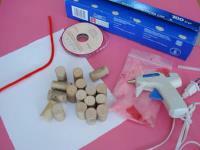 Set aside until the glue is completely dry. 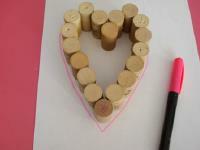 Delicately separate the cork heart from the waxed paper. 7. Use the pipe cleaner to form a hook as shown. 8. Glue the hook to the top of your heart. Cut a piece of ribbon long enough to be wrapped around the heart. 9. 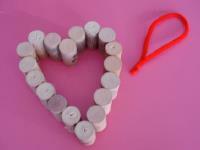 Apply a few dots of glue along the outside of the heart and press the ribbon on them. 10. 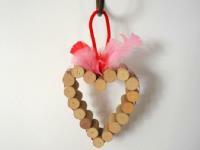 Add a few feathers to the top of the heart and hang it. 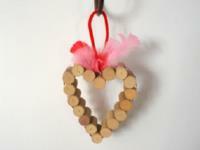 This heart also makes a great gift.